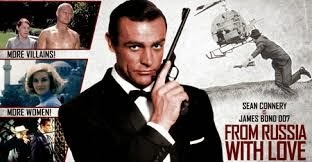 CBSNews.com offers a piece on the poll taken on which actor best portrayed Ian Fleming's iconic James Bond character. Over the past 50 years there have been 23 official James Bond films, and the character has been portrayed by six different actors. So who was the best Bond? Americans strongly favor the first man to portray the character in film, with 51 percent picking Sean Connery as the best James Bond. Connery originated the role in the 1962 film "Dr. No." He would go on to star in five more Bond adventures, in addition to the non-official 1983 Bond film, "Never Say Never Again." Note: I agree that Sean Connery was the best James Bond, but I would rank Timothy Dalton as the second best and George Lazenby as the third best. Timothy Dalton offered film viewers a harder, more serious Bond than the previous Bond, Roger Moore, and although their were some silly bits in his two Bond films, I thought they were well done. George Lazenby was a good Bond, in my view, considering that he had never acted before, and he had to follow Sean Connery. He looked like Ian Fleming's Bond and he did the fight scenes very well. Had he continued as Bond he might have grown into a very good Bond. I also think On Her Majesty's Secret Service is one of the best Bond films. As for Pierce Brosnan, he had some good moments as Bond, but I was not too thrilled with the films he starred in. As for Roger Moore, I liked him as the Saint on TV when I was a teenager, but I didn't like his light-hearted portrayal of Bond and I didn't like the silly films he starred in. Lastly, I'm glad that the film producers have returned to making Bond films thrillers, instead of silly comedies, and Daniel Craig is a good Bond, even he does not look like Fleming's Bond. I think the producers should have hired Clive Owen instead of Craig. Owen would have perhaps offered a Bond to rival Sean Connery. I'm looking forward to seeing who the next Bond actor will be.